Looking back more than a century, the high regard in which contemporaries held pitcher Al Maul is somewhat puzzling. The stats that he compiled during his 15-season major league tenure are far from eye-catching, and his record is dotted with extended periods of inactivity. Characteristically, his career highlights – a National League ERA crown in 1895 and a 20-win campaign three years later – are separated by seasons wherein he appeared in only a handful of games. Indeed, those two achievements aside, Maul’s work was, at best, mediocre. Yet whenever Al announced that his oft-ailing right arm was back in shape, employment awaited him. This lends itself to two conclusions: (1) Maul possessed pitching attributes not reflected in his stats that are now lost to time, or (2) a cheerful countenance, upbeat personality, and steady work habits endeared Maul to club owners and managers as much as it did to baseball fans. Whichever the case, the game provided a lifetime sinecure for Smiling Al Maul. After retirement from playing in 1901, he worked for the Philadelphia Athletics and Phillies for decades. Baseball lifer Albert Joseph Maul was born in Philadelphia on October 9, 1865. He was the fourth of six children born to Andrew Maul (1832-1902) and his wife Amelia (nee Franzmathes, 1834-1914). The elder Mauls were German-Catholic immigrants who eventually settled in the City of Brotherly Love where Andrew found work as a carpenter and cabinetmaker.1 The Mauls were parishioners at St. Peter’s Church where Al attended parochial school through the eighth grade.2 He then entered the local work force as a pocketbook maker. 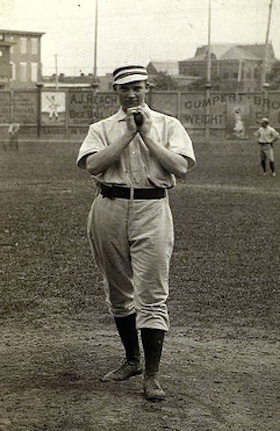 As Maul later recalled his boyhood, he used “to steal out of the house whenever he could to play ball on Philadelphia’s corner lots.”3 Good-sized (eventually 6-feet tall and about 200 pounds)4 and a standout right-handed batter and thrower, he thereafter rose to prominence in city amateur ball and semipro circles. At age 18, Maul was given a tryout by the Keystones, Philadelphia’s entry in the one-season major league Union Association. On June 20, 1884, he entered the box and took a 7-3 loss to Baltimore. According to a trite Baltimore Sun game account, “Maul, the pitcher for the Keystones, fulfilled the mission which his suggestive name implied. He was severely smitten.”5 In truth, the youngster had pitched well, tossing a complete game and allowing Baltimore only one earned run. 6 Still, the Keystones chose not to give him a second chance. Al joined the professional ranks in earnest the following year, signing with the Binghamton Bingoes of the New York State League. But his freshman pro year ended prematurely, and with a foreshadowing event: a debilitating injury suffered in an early-August game against Utica. Well before the season was over, Al was home recuperating in Philadelphia.7 Recovered, he started the 1886 campaign with the Rochester Maroons of the International League, but was released early in the season.8 He then rejoined Binghamton, now also a member of the IL, but primarily as a position player, rather than a pitcher. This, too, foretold developments that would occur during his ensuing major league days. A capable hitter, Maul was often positioned at first base or in the outfield, particularly during his Pittsburgh years. Despite its investment in him and Maul’s promising start, Philadelphia sold him to Pittsburgh in January 1888 for a mere $1,000.16 With his new club, Maul’s position was unsettled, with Alleghenies manager Horace Phillips advising the press that Maul had been acquired to play first base, and would only pitch “once in a while.”17 But Al’s defensive play at first was ragged, and he failed to hit. By mid-season, Pittsburgh was openly shopping Maul, with minor league clubs in New Orleans and Wheeling, West Virginia, reportedly the most ardent suitors.18 The matter came to naught, however, when telegrams that sought the cooperation of other major league clubs needed to sneak Maul through waivers were leaked to the press.19 Al finished an unhappy first season in Pittsburgh with a meager .208 batting average, and went 0-2 in three pitching efforts. With pitching talent now spread thin over three major leagues, Maul was pressed into hurling service – and responded with a fine season. Pitching for a losing (60-68) Pittsburgh Burghers team, he went 16-12, throwing more innings (246 2/3) than he had in his prior major league seasons, combined. He also filled in 15 times in the outfield, batting .259 overall. When the PL collapsed at the close of the 1890 season, the rights to Maul reverted to the Pittsburgh club of the National League, where a season of frustration and increased notoriety lay in store. Plagued by the onset of what would become chronic arm miseries, Al made only three starts for the club now called the Pirates, going 1-2, with a 2.31 ERA in 39 innings pitched. He also did brief and unproductive tours in the Pittsburgh outfield, batting (.188) and fielding (.878 FA) poorly. Meanwhile, Pud Galvin had taken to calling his handsome, well-built teammate “Adonis,”21 heralding a press fixation on Maul’s good looks and fastidious tailoring that would last the remainder of his career. Although Maul was reserved by Pittsburgh for the upcoming 1892 season, newly installed club president William C. Temple released him immediately upon taking office.22 With the demise of the American Association reducing the major leagues scene to the 12-club National League, Maul’s employment prospects were bleak. His options appeared limited to accepting an offer from minor league teams in Milwaukee and Los Angeles, or continuing his off-season job at the grocery operated by his older brother Gus.23 In the end, he did neither, choosing instead to sign with the hometown Philadelphia Athletics of the newly-formed Eastern League.24 Unfortunately for Maul, the Athletics’ stay in the circuit would be brief. When the club disbanded in mid-June, Maul was dispatched to Buffalo in the Eastern League dispersal draft.25 Engaged as a pitcher, Maul was soon deemed “a dismal failure” and released by Buffalo in mid-July.26 He then went home and rejoined the family grocery. In March 1893, manager Jim O’Rourke of the pitching-starved Washington Senators decided to take a chance on Maul and signed him.27 His arm evidently benefitted from the layoff. Unaffected by the elongation of the pitching distance to 60-feet, six-inches, Maul turned in yeoman, if not overly effective, work. Tossing a career-high 297 innings for a Senators club headed for a dead-last (40-89, .310) finish, Maul squeezed a team-high 12 victories (against 21 defeats) out of a 5.30 ERA/1.680 WHIP. But an open, genial demeanor and a ready smile had made friends for Maul. He quickly became a favorite with Washington teammates, fans, and sportswriters. The following spring, two other Maul character traits were in evidence: a tough-minded attitude toward salary negotiations and an aversion to spring training camp. Maul’s second campaign in Washington near-repeated his first. He turned in a better-than-the-norm 11-15 (.423) record for another bad (45-87, .341) Senators club. But the following year, Washington, fortified by the acquisition of pitcher Win Mercer, third baseman Bill Joyce, outfielder Kip Selbach, and other first-rate talents, got off to a fast start. Maul, now featuring a pitch described like the modern slider, more than did his part, going 10-5 into July. Then, while throwing a sodden ball during a rainy July 3 game against Baltimore, something snapped in Maul’s elbow. He was finished for the season, his only consolation being a National League-leading 2.45 ERA when final stats were tabulated. Sporting Life editor Frank Richter enthusiastically endorsed the signing,41 but Maul had little left in his aching right arm. He posted a 2-3 log with a 6.16 ERA in 38 innings for the Phillies, and was then given his release.42 When no other club sought his services, Maul returned to the family grocery business. But he still hankered to pitch. Late in the 1901 season, the New York Giants, then in a dogfight with Cincinnati for the National League basement, afforded Maul his final big leagues fling. He started and lost three late-season games for the Giants, getting pounded each time. After an “awful mauling” by Pittsburgh,43 Maul was given notice of his release, bringing a 15-year run as a major leaguer to an end. On balance, he had had a middling career. In 187 games pitched, he had gone 84-80 (.512), with a 4.43 ERA in 1,431 2/3 innings pitched. Never a strikeout pitcher, Maul had fanned only 346, while walking 518 and hitting 67 enemy batsmen. And the .285 batting average posted against him was high, even for the high octane hitting era that Al had largely pitched in. Maul, however, had been no slouch with the stick himself, posting a respectable .241 lifetime batting average. In fact, his offensive prowess deposited him in more major league games as an outfielder, first baseman, and pinch-hitter (226) than he logged as a pitcher. Through it all and pedestrian numbers notwithstanding, the likeable Al Maul retained the affection and esteem of his contemporaries – club leaders, teammates, sportswriters, and fans, alike. Sources for the biographical detail provided herein include the Al Maul file with questionnaire maintained at the Giamatti Research Center, National Baseball Hall of Fame and Museum, Cooperstown, New York; Maul family tree information posted on Ancestry.com; US Census reports and listings in Philadelphia city directories; and various of the newspaper articles cited below. Statistics have been taken from Baseball-Reference. 1 Government records conflict regarding when the Maul family settled in Philadelphia. The 1860 and 1870 US Censuses indicate that the family had previously resided in Canada and Wisconsin where five of the Maul children were born. Later censuses and Pennsylvania records indicate that all six Maul children were born in Philadelphia. Al’s siblings were Joseph (born 1856), August (1858), Christina (1860), Katherine (1868), and Sophia (1871). 2 As per an entry in the 1940 US Census and the Al Maul player questionnaire submitted to the Giamatti Research Center by his nephew Albert R. Karcher sometime during the 1970s. 3 See “Al Maul – Superb Pitcher of the 90’s – Where’s He At Now?,” a syndicated column published in the Cincinnati Post, December 21, 1912, Wilkes-Barre (Pennsylvania) Times, December 27, 1912, and elsewhere. See also, an undated circa 1888 New York Clipper profile of Maul contained in his file at the GRC. 4 Modern baseball references list Maul’s weight as 175 lb., but late-career photos suggest that the broad-shouldered Maul was considerably heavier. The questionnaire completed by his nephew for the GRC put Al’s weight at 215 lb. 5 Baltimore Sun, June 21, 1884. 6 According to the contemporaneous box score published in the Baltimore Sun, June 21, 1884. Baseball-Reference lists four of the runs yielded by Maul as earned. 7 As reported in Sporting Life, August 19 and September 9, 1885. 8 As per the report of International League secretary O.D. White, published in Sporting Life, June 9, 1886. 10 See Sporting Life, June 15, 1887. 11 See the Denver Daily News, June 16, 1887, and “A Haul for Maul,” Sporting Life, June 22, 1887. 12 Sporting Life, June 22, 1887. 13 Philadelphia Inquirer, June 17, 1887. 15 See e.g., the Denver Post, August 21, 1899, and the syndicated column about Maul published in December 1912, cited in endnote 3, above. At the time, however, an indignant Henry Chadwick branded the “palm” accorded to Maul an “absurdity,” given that Maul had only appeared in 16 league games that season. In Chadwick’s opinion, the batting title rightfully belonged to Chicago manager-first baseman Cap Anson who had posted a .421 BA in 122 games. See “Chadwick’s Chat,” Sporting Life, October 30, 1887. Modern reference works adjust the 1887 Maul batting average to a modest. 304, and accord the NL batting title to Anson (.347). 16 Per Sporting Life, January 11, 1888. 17 Sporting Life, February 22, 1888. 18 See the Cincinnati Commercial-Tribune, June 10, 1888, and Sporting Life, June 22, 1888. 19 See the Wheeling (West Virginia) Register, July 29, 1888, and Sporting Life, August 8, 1888. 20 Per Sporting Life, November 13, 1889. Manager Hanlon, second baseman Fred Dunlap, and catcher Fred Carroll reportedly invested similar sums. 21 As reported in Sporting Life, October 3, 1891. Short, homely, and disheveled, future Hall of Famer Galvin was the very antithesis of “Adonis” Maul, and may not have intended the moniker kindly. If so, good-natured Smiling Al took no offense. 22 As reported in the Chicago Daily Inter-Ocean, December 10, 1891. Temple also jettisoned two other players. 23 As per Sporting Life, April 16 and 30, 1892. 24 As reported in the Philadelphia Inquirer, April 27, 1892, and Cleveland Plain Dealer, April 28, 1892. 25 As per Sporting Life, June 25, 1892. Players from the disbanded New Haven club were simultaneously distributed. 26 As reported in Sporting Life, July 30, 1892. 27 As reported in Sporting Life, March 28, 1893. 28 As per Sporting Life, March 21, 1896. Among Maul’s customers was heavyweight boxing champion James J. Corbett, the older brother of Senators teammate Joe Corbett. The champ reportedly bought a $300 diamond from jewelry merchant Maul. 29 Sporting Life, June 6, 1896. 30 As per the Philadelphia Inquirer, September 6, 1896. 31 As reported in Sporting Life, September 26, 1896, the Kansas City Star, October 1, 1896, and elsewhere. The winner’s prize was a bicycle valued at $100. 32 Cleveland Plain Dealer, August 29, 1896. 33 As reported in the Cleveland Plain Dealer, April 9, 1897, Washington (DC) Evening Star, April 10, 1897, and elsewhere. 34 Sporting Life, May 22, 1897. 35 Cincinnati Post, June 28, 1897. 36 As per the New Haven Register, December 6, 1897, and the Philadelphia Inquirer, January 16, 1898. 37 Sporting Life, October 29, 1898. 39 As reported in the Cleveland Plain Dealer and Sporting Life, September 2, 1899. In deference to the bride’s faith, the wedding ceremony was performed at Arch Street United Methodist Church, the Rev. Dr. Wilcox officiating. 40 As reported in Sporting Life, September 23, 1899. 41 Richter wrote: “Al Maul is one of those grand old veterans who have nothing except the ability to deliver the goods.” Sporting Life, May 26, 1900. 42 As reported in the Boston Herald, July 8, 1900, Washington Evening Star, July 10, 1900, and elsewhere. 43 This last-discovered iteration of the overworked pun was found in the Grand Rapids (Michigan) Press, September 2, 1901. 44 As per the Philadelphia Inquirer and Washington Evening Star, February 28, 1903. 45 Sporting Life, March 18, 1905. 46 According to the Cleveland Plain Dealer, September 13, 1898. 47 As reported in Sporting Life, July 25, 1908. 48 See e.g., the Aberdeen (South Dakota) Daily News, May 10, 1933. When Maul made his major league debut with the 1884 Keystones, Clements had been his receiver. 49 The official causes of death were heart and kidney failure; see the death certificate contained in the Al Maul file at the Giamatti Research Center. 50 “Smiling Al Maul, 92, Dies; Former Washington Pitcher,” Washington Evening Star, May 5, 1958.